Just as workers unite in a union to protect their rights, so also do unions unite in central labour bodies to fight for better working and living conditions. 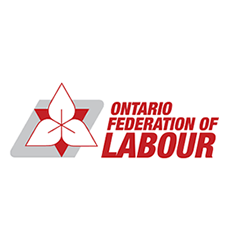 The Ontario Federation of Labour (OFL) is the province’s “house of labour” and serves as an umbrella group for working people and their unions. From its inception in 1957, the OFL has grown to represent over one million Ontario workers belonging to more than 1,500 locals from 54 affiliated unions, making it Canada’s largest provincial labour federation. The OFL’s strong membership and militancy makes it a formidable political voice. The OFL pushes for legislative change in every area that affects people’s daily lives, including health, education, workplace safety, minimum wage and other employment standards, human rights, women’s rights, workers’ compensation, and pensions. It also makes regular presentations and submissions to the Ontario government and mounts internal and public awareness campaigns to mobilize the kind of political pressure that secures positive change for all workers – whether or not they belong to a union. In order to accomplish these goals, the OFL works with affiliated local unions and labour councils in local and regional areas across the province, but perhaps most importantly, the OFL proudly partners with other community and social justice organizations to build a strong economy and inclusive society that meets everyone’s needs.